When you hear the words ‘design classic’, it may conjure up thoughts of a Swiss made Rolex watch or you may think of the French made Citroen DS. But the world of coffee and brewing has some classics too … The Italian made Atomic Mocha-pot, the Swiss made Bodum and the Dutch made Moccamaster. A little while ago, the HHC team flew to Holland to visit the lovely people of Moccamaster and sit in on the production line. We dug deep in the history of its invention, and met the inventor himself who was still tinkering and inventing at the age of 82, in a pair of grease smudged overalls. Can you tell us a bit about how the Moccamaster came about? It was invented by my father in-law (Gerard Clement) in the sixties. He had been working at Moulinex who made affordable coffee grinders with spinning blades. Gerard Clement could see that the blades would make a very uneven grind which would result in a nasty tasting brew of coffee. So Gerard simply designed a blade grinder that has a perforated screen which holds back the larger particles. This results in a better extraction, it’s not a perfect solution, but it’s a great solution for good tasting coffee in the household and was affordable and effective. Gerard is an inventor and loves to discover and play, so he later invented the Moccamaster and formed the company that you know today. Back then there was almost no such thing as a machine that can make a good cup of filter coffee so Moccamaster was a big success. It makes a great coffee and will never breakdown. Despite the fact that this machine will last you for life… We still produce 2000 per week. Why do you think the Moccamaster is such an icon of design? So how does the brew quality of the Moccamaster compare with other filter machines? There are simple ideas that ensure that this brews better than any other. You can control your steep time and you can move the pour around the coffee like a hand pour-over. People have tried to copy its simple system over and over again, because it works the best. Is this a machine that is just for the geeks? Or is it really that good? In a word or two – quality parts. So here is some technical stuff for the coffee geeks. Most coffee makers use aluminium heating elements to heat the water and maintain the temperature for brewing. Aluminium is cheap, so the manufacturers keep costs low by skimping on the most expensive part of the works. 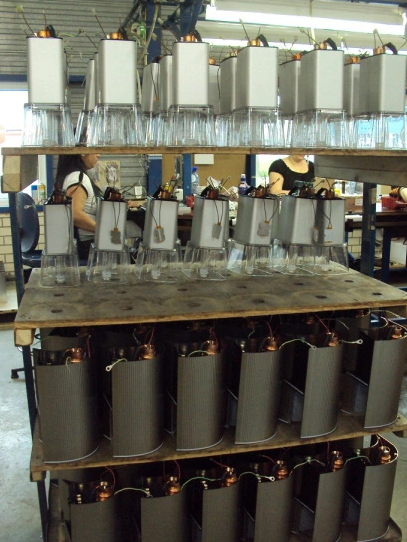 Moccamaster make their heating elements from copper, which has far better heat conductivity than aluminium. That means that the water gets hot faster and maintains its temperature longer. In addition, the Moccamaster operates at 1400 watts of electrical power. Most other coffee makers only operate at 900 watts, so the Moccamaster heats water faster and makes coffee more efficiently than other machines. Aside from that, the Technivorm is completely handmade and each and every coffee maker is checked for quality three times before it leaves the factory. So is it worth the high price tag? I guess that depends on just how important your coffee is to you. If you’re looking for the top of the line for your home coffee needs, this just might be it. HHC is impressed, so we bought one or two … Directly from the inventor himself.